A male Olive Ridley sea turtle was discovered with a 12cm plastic straw lodged inside its nose in Costa Rican waters. A research team rescued the turtle and explained, alongside a video of the removal procedure, that they first believed the foreign object was a parasitic worm. Blood drips from the turtle’s nose and the sea creature appears to be in a lot of pain throughout the entire ordeal. 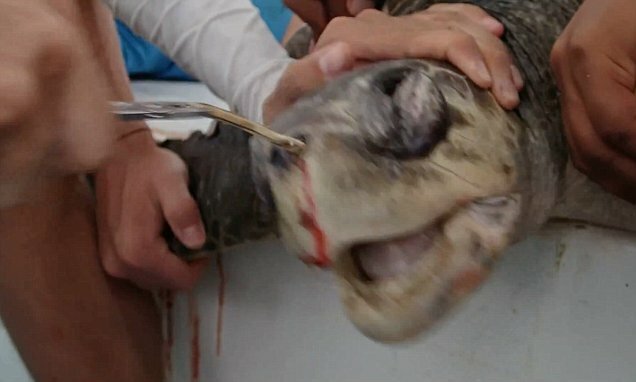 WARNING: GRAPHIC CONTENT This distressing footage captured the moment a plastic straw was pulled from the nose of a sea turtle after it was discovered lodged inside in Costa Rica.